I had to buy 4 complete kits from Mikes. 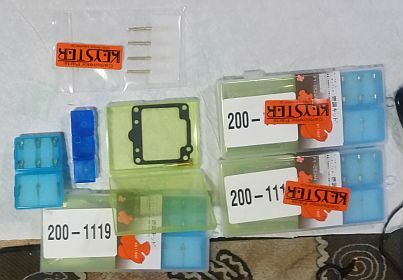 So I removed the tubes from the kits and I'm selling what's left. These are nice kits, with plastic compartments for the various parts. They are exactly as pictured, MINUS THE EMULSION TUBES/NEEDLE JET/JET HOLDERS. 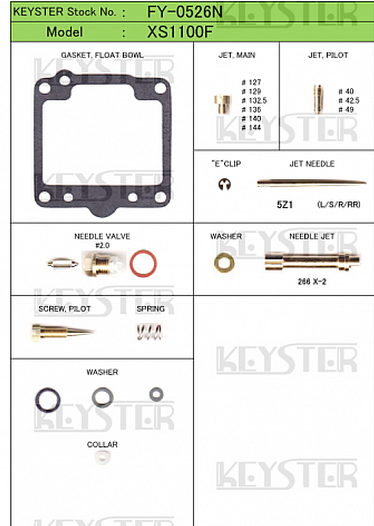 24 jets, 16 needles, 4 needle and sets, 4 mixture screws, 4 bowl gaskets, plus small parts. I had already bought just about all of this separately , so I don't need these kits . I paid $180 , so I'll sell all remaining parts for $90 , with free USPS shipping, USA only. I am traveling this summer, so you must use PayPal. I will ship from nearest PO , once I receive payment. I will leave this ad up for 1 week to give you guys first shot..Then they'll go on the auction site. I ended up using 3 out of the four mixture screws from the kits. My bike (carbs) are better than ever.